There were many books that helped me while I was looking for information about Regency life and fashion. Here is a small listing with links to Amazon.com, where you can read reviews and/or purchase them. For a list of books to read after you've finished all of Jane Austen's Novels, click here. For a list of my favorite Fairy Tales, click here. "This fascinating, lively guide clarifies the sometimes bizarre maze of rules, regulations, ans customs that governed everyday life in Victorian England. Author Daniel Poole provides countless intriguing details on the Church of England, Titles, Parliament, dinner parties, country house visiting, and a host of other aspects of nineteeth century English life--both "upstairs" and "downstairs". An illuminating glossary gives at a glance the meaning and significance of terms ranging from "ague" to "wainscoting", the specifics of the currency system, and a lively host of other details and curiosities of the day." Jane Austen's World looks at the woman behind this phenomenon and the world in which she lived. The book takes the reader on a tour of the England of Jane Austen's lifetime. A period of dramatic change. The French Revolution and the Napoleonic Wars raged on the continent; England consolidated its Empire and King George III slipped into madness, heralding a Regency for England. On a calmer note, Jane Austen's World looks at the manners and conventions of the time, the beautiful fashions inspired by Ancient Greece and the arcadian vision that permeated the architecture and great gardens of the period. This book truly captures the essence of the imortal Jane Austen, the romance of her age and the era in which she lived. Also included are summaries of each of the novels and lavish illustrations including pictures from the recent movies. "Susan Watkins, working with the internationally acclaimed photographer Hugh Palmer, allows us to experience through the eyes of a country gentlewoman the styles and customs of the England two centuries ago. Doors are opened to reveal the shade and stripe of wallpaper, the arrangement of furniture and even the complex workings of the kitchen. The exploration of the style of Jane Austen's England is completed by a directory of sources for period furnishings, fashions, china and glass." Regency England was, according to Venetia Murray, a "glorious paradox": High society placed a premium on civilized living, yet vulgarity, gluttony, and moral vicissitude were considered fashionable--and socially acceptable--vices. In An Elegant Madness, Murray examines this polarity, providing readers with an accurate, entertaining, easy-to-read portrayal that conveys the mood of the period, focusing primarily on the oft-paradoxical social practices and attitudes of the English aristocracy. I strongly suggest reading the reviews at Amazon.com before reading the book. 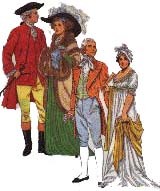 Noted fashion illustrator Tom Tierney has created many paperdoll books concerning the people and fashions of the Regency. All contain extensive notes and history. To recreate the fashions of the celebrated era, Tom Tierney has carefully researched the period and accurately rendered two dolls and thirty costumes. Beautifully drawn in fine detail, these dolls and thier wardrobes provide a vivid picture of what the well-dressed English were wearing nearly two centuries ago. America in the early 1800's was a young, vibrant and changing country. Like the nation, clothing styles were also in a state of transition, with apparel copied after European fashions often displaying a distinctly American flavor in transition. A total of nine dolls and 46 attractive costumes show the family at work in the home, on the land, smartly outfitted for an excursion into town, dressed for a winter outing and elegantly attired for a family wedding. Shown here are six dolls--meticulously drawn representations of George and Martha Custis Washington and the Custis grandchildren (two of whom Washington adopted), plus 32 costumes. Together the family represents an authenitc view of what well-to-do Americans were wearing in the late 18th and early 19th centuries. 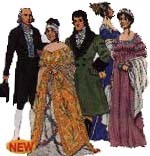 An Accurately rendered, full-color collection of 10 dolls and 26 costumes depicts the President, his daughters Maria and Martha, Dolley Madison (who frequently served as White House hostess) and six grandchildren. James Madison, the widely heralded "Father of the Constitution" and scholarly fourth president of the United States, was 43 when he married the much younger Dolley Payne Todd. An attractive widow who surrendered her Quaker faith to dazzle society with her charm and social acumen, Dolley set trends in fashion and entertaining during the Madison years in Washington (1809-1817). 5 Dolls, 29 costumes on 16 plates. In both his book Empire Costumes, Tom Tierney celbrates the early 1800's with his incredible drawings. This book features two dolls and between 15-20 constumes, with detailed notes. Don't miss these handy source books- they are wonderful tools to use as inspiration for your next project. Empire Costumes in is in the Tom Tierney "History of Costume" Series series. Free Dover Full-Color Children's Book Catalog (59071-2) available upon request from Dover publications.